After waiting six months in vain for a distributor to officially represent wines from one of my favorite Chinese wineries — Kanaan in Ningxia — I have decided to sell my own stock. I have done over fifteen tastings of Kanaan wines with consumers and trade people, have received good feedback, and will have a dozen bottles each of the dry Riesling, semisweet white and dry red blend (photo below) available Saturday at the shop La Cava de Laoma (details below). Consider this also the official launch of a project known for the moment as as The Grape Wall & La Cava Chinese Wine Bar & Shop. (Write that name down cuz it’s hard to remember.) More details to come from me and La Cava’s Mariano Larrain soon. Back to Kanaan: This project is run by Wang Fang, known as “Crazy Fang“, who lived in Germany for over a decade and returned to China determined to make wine (she’s in the top left photo). I visited Kanaan last year with winemakers from Bordeaux, Napa, Mendoza and Stellenbosch and they enjoyed the wines. Kanaan has also received praise from top critics like Jancis Robinson, Michel Bettane and Thierry Dessauve. Most importantly, fellow consumers like these wines. You can reserve up to three bottles but need to pick them up Saturday or make other arrangements with me. Reserve bottles or check on supplies via my weixin account — ID: beijingboyce — or email me at beijingboyce boyce (at) yahoo.com. La Cava also has lots of other delicious wines from rmb50 per bottle and, on Fridays and Saturdays, wine by the glass from rmb15. You can enjoy them in the shop, which has seating for about two dozen people, and also order in food. Finally, I’ll probably bring a few other Chinese wines to share. 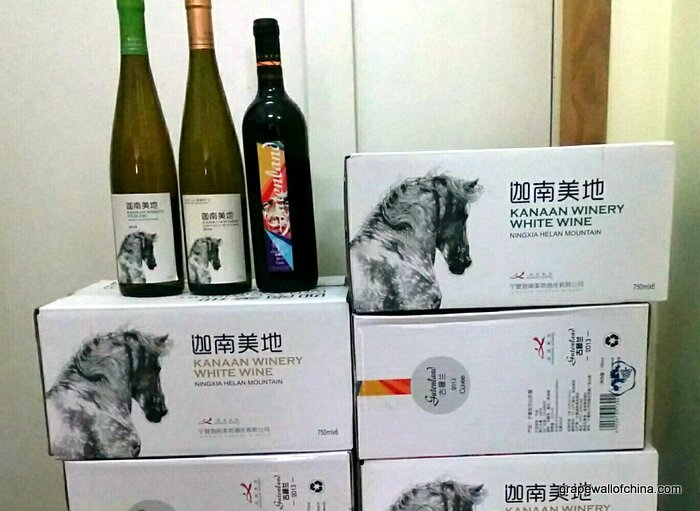 What: Sale of Kanaan wine from Ningxia, one of the best wineries from what is widely seen as the China’s best region. Where: La Cava, Sanlitun SOHO, Building 3, number 133. The shop is in the only orange-ish building in the complex. Go inside and you will find it on the first floor at the south end. Who: Those interested in Chinese wines. Unless you are a snob, and like to show off your knowledge while making others feel insecure. In that case, go hang out at Jenny Lou’s and bother the wine buyers there! Why: Because I’m tired of waiting and want to share these wines.